Date Added: Thursday 12 October, 2017 by Shaun G.
I ordered this jacket in another hard to find color (which is a running theme for me), and Indy pulled through once again, sending me pictures of swatches until the brightest orange was found. This was the second jacket I ordered from Magnoli and it was just as well done as the first. The zippers, the linings, were all high quality. I work at a film company in California and get asked about these jackets all the time, they're that good!.. 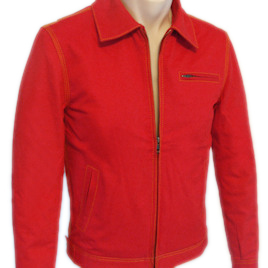 Date Added: Thursday 13 September, 2012 by LECCIA R.
I received my Smallville Jacket, red with yellow stitching, smashing ! It is like the jacket of the serie, the red colour is awesome and the stitching are really well done. Very great job, keep on like that !.. Date Added: Thursday 23 July, 2009 by Artine K.
Date Added: Wednesday 15 July, 2009 by Andrew G.
My Red Smallville jacket just arrived in the mail today and I only have one word: PERFECTION! The color of red used on this jacket is amazing and the contrast stitching just makes everything about this jacket awesome! The material used is a lighter canvas, but still obviously durable enough for normal everyday wear. This jacket really looks like it was taken straight from the set of Smallville! Great job! 5 stars!.. Date Added: Tuesday 26 May, 2009 by Daniel A.